You may have heard a lot of anti-Microsoft jokes before since you can read them everywhere. However, it's pretty rare to find anti-UNIX/Linux jokes. So I would like to share with you some pretty old but still funny anti-UNIX one-liners. Enjoy! * If Unix is the answer, then it must have been a stupid question. * Unix is the only virus with a command-interface. * How can an operating system from 1970 (UNIX) be more modern than an operating system from 1978 (VMS)? * Unix - the first computer virus. * NFS = Nightmare File System. * Berkeley is famous for LSD and BSD UNIX. I don't think that is a coincidence. * Sure, the Unix file system corrupts your files, but look how fast it is! * Friends don't let friends use Unix. * Unix - the ideal operating system for CPU's that are never powered up. * Nothing wrong with UNIX that a total redesign and rewrite cannot fix. * UNIX will be preempted by NT. UNIX doesn't know it yet - it won't notice until it's too late, because UNIX is the Yugoslavia of software, at war with itself -- but it's all over. * The users of Unix systems said speed wasn't an issue when the Alpha chip was released. The same people tell their wives and girlfriends that size doesn't matter. * If Unix were a beer, then it would be shipped in open casks so that anybody could piss in it before delivery. * UNIX is user friendly. It's just selective about who its friends are. * UNIX is akin to a religion to some. If things aren't done like they are in UNIX, then they must be bad. Sorry, I don't believe in this religion. * UNIX is a four-letter word! * VI = Virtually Incomprehensible. * Unix is about as user friendly as a blow in the back from an ice-pick, only not quite as productive. * What has happened, when a system-manager gets gray-haired in one day? One day with a UNIX system! 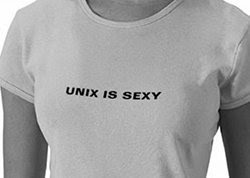 * How do you pronounce UNIX? You Nix! * Cretin and UNIX both start with C.
* The scariest thing about Jurassic Park was that the control systems were Unix. * Why is using a UNIX system like being an Enuch? Every time you go to do something important, you realize something critical is missing. If you know of other funny anti-UNIX/Linux jokes, please share them with us via comment. These definitely made me chuckle! Especially the open casks bit. :-).